Detective Christopher Tortorello speaks at an Evanston Police Department town hall Thursday. Police answered residents’ questions about social media and community relationships. 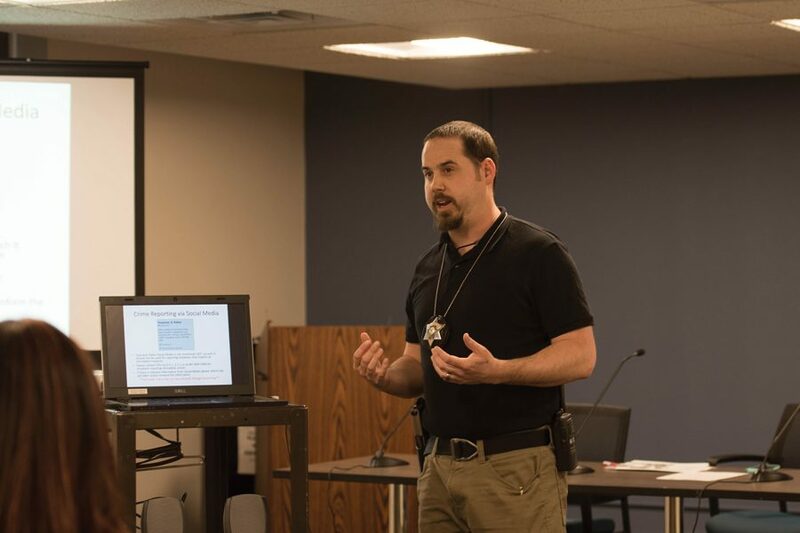 Evanston Police Department answered residents’ questions about its use of social media as an investigative tool and a medium to connect with the community at a town hall meeting Thursday. EPD has called town halls at the Lorraine H. Morton Civic Center over the past two years to bring residents and police together, said Gilo Logan, who facilitated the discussions. Logan is a professor at Northeastern Illinois University and the son of former Evanston chief of police William Logan. At Thursday’s meeting, Logan read residents’ questions to a panel of EPD officers and detectives, and voiced concerns from community members who did not attend. About 20 residents attended the meeting and another 20 watched the discussion via Facebook Live, a new tactic EPD plans to employ at future events. “We as a department thrive on community engagement to help us keep Evanston safe,” said detective Michael Andre, who served on the panel. EPD uses its Twitter account for quick updates about breaking incidents, such as accidents and road closures that cause traffic delays. The department’s Facebook advertises community events and shares pictures after the fact. Detective Christopher Tortorello said YouTube is another useful website for police. The video sharing platform is popular among gang members because they can easily reach a large audience, he said, and sometimes rival gangs will respond with threats in the comments section of YouTube videos. There are around 10 gangs and approximately 400 documented gang members in the city, Evanston police Cmdr. Ryan Glew said in February. While EPD keeps a gang database, they do not constantly monitor social media, said detective Thomas Giese. Typically, detectives wait for a tip from a community member before searching for a specific account. But even when police find suspicious behavior online, Giese said they need more evidence before they can take action. But some residents said after the meeting they still do not trust police. Vivian Killebrew, who attended the meeting, moved to Evanston 15 years ago and said police frequently stopped her son for “driving while being black” after he graduated from high school. Logan, the moderator, said EPD will conclude the town hall series this fall with a meeting focused on rights, responsibility and reasonability of police where residents like Killebrew can express their skepticism.